Qayanek is passionately dedicated to antiquity research, documentation, preservation, and construction of the traditional Native American Yup’ik Caninermiut Qayaq. Qayanek builds kayaks as close as possible to how they were designed in traditional mud houses. 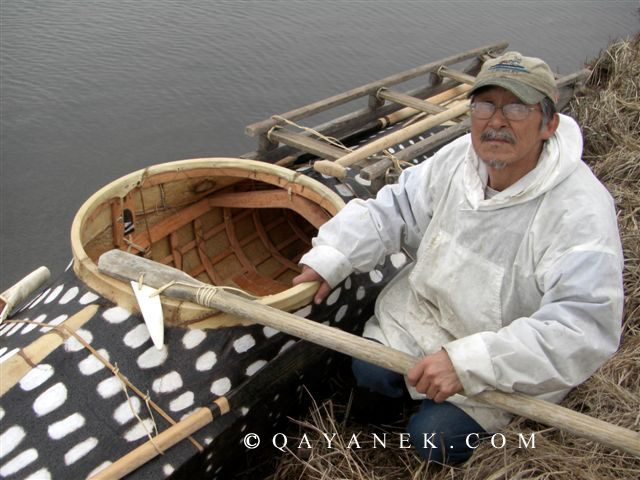 Of the two basic Yup’ik kayak designs, the less documented eastern version, built in Kwigillingok, Alaska, may be the more elegantly engineered. The Caninermiut Qayaq has 2 bow, 4 stern, and 5 cross members that are tediously extracted from the bends of driftwood spruce stumps. All measurements are custom anthropomorphic body measurements. Qayanek’s real seal skin on frame kayak is caulked using seal oil and moss, with grass strands backing the inner seams.